Pandor, an abbreviation of the French words "pain d'or," meaning golden bread. Pandor Bakery is a French Boulangerie themed cafe offering authentic freshly baked breads, pastries, tartlets, breakfast, specialty salads and paninis. Owners Tiffany and Raffi Sepetjian created the vision of Pandor eight years ago alongside master French bakers and pastry chefs, bringing southern California a new taste to local bakeries. Pandor’s artisanal products continue to strive through excellence in Newport Beach, Long Beach and Anaheim. Their third location at Anaheim Packing District recently opened in August 2015 and is bringing artisan crafted creations like sweet and savory crepes and Meringue Bombs to the community. What sets Pandor apart from other bakeries; key foundations. Incredibly talented French chefs, specialty ingredients, superior equipment, and a classic, artisanal baking process. Every night at Pandor from 10 p.m. to 5 a.m. their bakers are perfecting the art of artisan crafted dough. Their consistency with attention to detail and their unique flavors continue to perpetuate success for their cafes. Their French chefs use of specialty ingredients and superior equipment facilitate seamless execution of their classic, artisanal baking process. Everything is produced in-house from scratch every single day, and the proof is in each and every bite of a flaky buttery croissant enjoyed in an al fresco dining atmosphere. Pandor Boulangerie & Cafe offers exciting menu options for breakfast, lunch and dinner. Professional chefs, pastry makers and bread bakers create unique options that reflect the travels of owners Tiffany and Raffi Sepetjian. 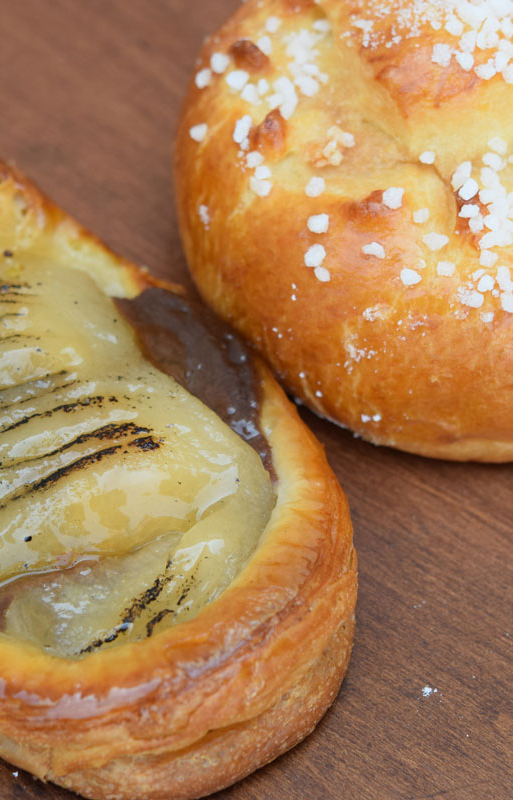 Take a tour of France with your tastebuds through bread, croissants, pastries and savories. For special occasions Pandor can also bring the experience to your guests through the catering options they have available. Chocolate Almond Croissant: Delicate, flaky crescent shaped croissant rolled with chocolate and topped with powdered sugar and roasted slivered almonds. Quiche Lorraine: A savory quiche made with fresh leeks, bacon & cheese served with organic green salad or french fries. Cronut: A light and sweet version of a Dornut that can only be described as magic made with croissant dough. Sweet and Savory Crepes: Authentic French crepes made with a secret dough recipe filled with sweet or savory options. Choose from menu items like the Sunny Side Up made with egg, tomato, basil, and extra virgin olive oil or the Cristo made with peanut butter and jelly. Guests can also create their own custom crepe with fillings of their choosing. Meringue Bombs: Custom made snowball shaped meringue balls that come in a variety of flavors featuring buttercream and whipped cream with meringue. Flavors include almond, pistachio and vanilla. Parking: South lot of Anaheim Packing House, Street Parking, Parking Structure on the corner of Claudina St and Broadway.